A recently purchased Fisker Karma was destroyed in the blaze. WASHINGTON (Bloomberg) -- U.S. auto-safety regulators are investigating a Texas garage fire that destroyed a Fisker Automotive Inc. Karma, a $103,000 plug-in electric vehicle. The U.S. National Highway Traffic Safety Administration sent investigators to help probe what caused the fire in Sugar Land, Texas, that Fisker learned of May 3, Claude Harris, the agency's director of vehicle safety compliance, said today. Autoweek, an affiliate of Automotive News, first reported the incident last week. "We are conducting an ongoing field inquiry for an EV incident in Texas," Harris said at a Transportation Department electric-vehicle safety forum in Washington. "We are still engaged in that activity, and no determination has been made at this time." 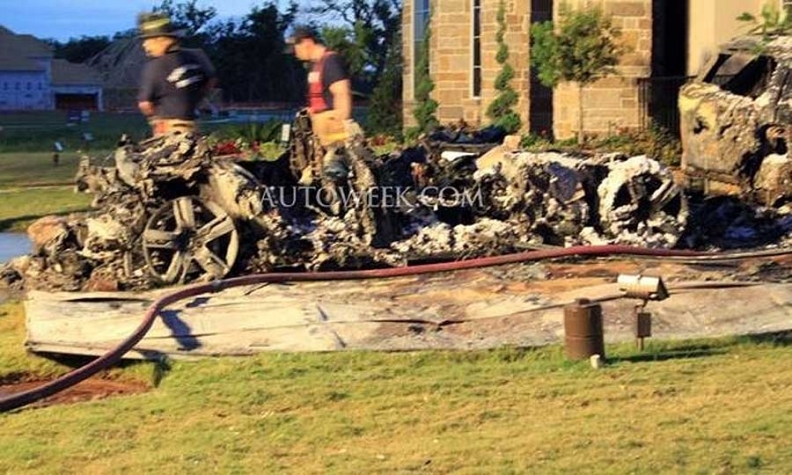 Lynda Tran, an agency spokeswoman, confirmed that the Texas investigation is of the Fisker fire. Fisker, in a statement, confirmed it is aware of NHTSA's field inquiry. "Our understanding is that such field inquiries are routine," the statement said. "We also understand that the officials looked at other vehicles involved in the fire too. The lithium-ion battery of the Fisker Karma was fully intact after the fire and has been tested and is in full working condition. "Currently, the precise ignition source and cause of the garage fire is still to be determined. Fisker is working alongside NHTSA and insurance adjusters to help determine the exact cause." Fisker, based in Anaheim, Calif., received $529 million in electric-vehicle loans from the U.S. Energy Department to develop the Karma and a proposed second model, the Atlantic. The credit line was frozen last year after the company was late in meeting milestones related to the Karma. NHTSA's inquiry is one in a series the agency has done of incidents involving electric vehicles equipped with lithium-ion batteries, Harris said. Others include a fire in North Carolina last year that was determined to not have been caused by the electric car, and an incident in which a General Motors Co. Chevrolet Volt caught fire three weeks after the agency performed crash tests on it. Fisker officials said May 8 that the car couldn't have caused the fire because its battery was intact and not being charged at the time, and because the vehicle was purchased after the recall of Karma models with defective battery packs supplied by A123 Systems Inc. It made those statements after a Fort Bend County, Texas, fire investigator was quoted by Autoweek saying the fire originated with the vehicle.